Back in 2005, the UFT under President Randi Weingarten negotiated the worst contract in NYC education history by giving up seniority transfer and Civil Service protected bumping rights. By doing so, it allowed the DOE to impose school based Fair Student Funding (fsf). The result was that it incentivized principals to hire "the cheapest and not the best teachers" for their school. 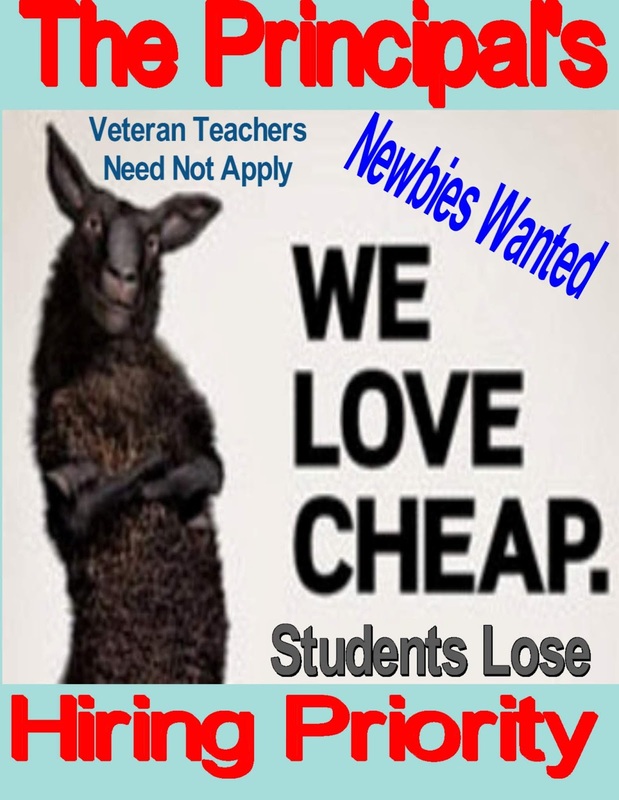 Consequently, student academic achievement suffered due to the influx of cheap "newbie teachers" who lacked classroom management. curriculum expertise, and the experience to handle different student learning styles. To fix the problem, the Mayor and Chancellor needs to eliminate school based fsf and restore District-based hiring as it was before fsf. Moreover, all vacancies must be filled by excessed teachers in their content specialty before "newbies" can be hired. This will eliminate the 1,000 strong ATR pool that drains the DOE coffers, help reduce class size, and eliminate the need for offering a $50,000 bribe to retire or resign from the DOE. Until the Mayor and his Chancellor restores the old hiring process, the DOE will continue to pay 1,000 teachers and other educators to babysit classrooms and that's a shame. Call me naive, but I do not think a teacher who is 22 years old and fresh out of college knows or cares about Fair Student Funding. If they want a teaching job and the DOE is hiring, they are gonna take it. The problem is teacher RETENTION. In my over 23 years of teaching, I see tons of newbies teach in the hell hole schools of NYC for a few years and then transfer to Westchester or Long Island where class sizes are low, principals are sane, and the stress level is manageable. Lets be honest. Senority transfers are NEVER coming back! There is no way that the UFT and the CSA or the DOE can spin to the public that principals cannot choose what teachers are coming into their school buliding. However there should be a hiring freeze until all atrs are placed. what a waste of money and resources. And yes - i ama an atr- before anyone accuses me of being an admin. but i am also a realisit. Westchester and LI have become very competitive. It’s not like NYC where all you have to have is a pulse to get a teaching position at the starting salary. Also many newly minted teachers are becoming discontinued after a few years to make room for cheaper bodies - why wait and go through all the trouble of false allegations to make them ATRs, do it before they get tenure. The UFT is in on all of it - a steady stream of dues is all they care about. They also need to revamp their firing process of Principals. They need to fire a whole bunch of them. Unity has allowed for our schools to deteriorate, and a bunch of lawyers are destroying careers based on lies. If Fair Student Funding had one budget unit price for teachers instead of some schools' average teacher salary being computer at $100K and another at $60K, most principals would snap up the experienced ones. This aspect of FSF is a Bloomberg holdover rule designed to discourage transfers of senior (high priced) teachers into schools with low average teacher salaries. I know of what I speak. The UFT reps are acting as informants for the DOE ti get rid of outspoken teachers. The ATRs are offered $50000 for a buyout. How about a buyout for everyone. Something more realistic like for every year of service you get one month of credit up to 22 years. (22 Months). This can be paid for by delaying the start of future raises. After all there is already precedence for this as it was previously done twice. Since nobody complained about it then, I do not believe that anyone will complain about it now. While what Chaz is calling for is sane and wise, we all know that the horse is out of the gate and there will be no return to any of those policies. From here on out the school systems are just the playground for education 'reformers' to milk like a cash cow. We have all seen more and crazier ideas being implemented in the schools, along with the costly PDs, books, bogus research, etc. The worst right now is the 'students have to teach each other' model that is sweeping NYC schools. Teachers only model 'activity guides' (what we used to call worksheets or group projects) and then the students are supposed to literally teach each other! You would be surprised how many Tier 6 teachers do not know the details of their tier and actually think they have a great pension waiting for them when they turn 55. Dearka likes to harass and discriminate against older teachers. Anon 11:19 PM, what is the connection between your comment about Dwarka* and Chaz’s post? Is it Dwarka’s goal to replace each older teacher with two newbies? What are Dwarka’s favorite techniques for harassing older teachers and for discriminating against them? What happens when teachers file complaints against Dwarka? It is a shame that the UFT is supporting age discrimination and hiring on the cheap. That is just what the DOE wants. A rotating gallery of newbies. That is why the school went downhill. Several Teachers sued Dwarka and the DOE and settled for some serious money. From an average test score of 44 in 2010 to an average test score of 16 in 2018. Let's see what happens in 2019. It will not be better. Too many newbies. The real issue in this system is the principals in 05 were given too much power. They should have less power. In my opinion, principals should have zero say over who they hire or budgets. That is not what they are trained for. Let HR hire people, assign them to schools, control exceeding and placement. However, this will never occur. CSA would fight this and win. She lost a case with a physical ed teacher and the news was on many different news programs alike even went national and the DOE just "settled" the case and this woman dwarka remains as principal of the school. Add to the fact that the school performs and is performing badly and it really boggles one's mind as to why dwarka is skating. Maybe this is a situation of its not what you know but rather who you know. Dwarka is known to be incompetent and embarrass an entire community, but yet the DOE leaves her there due to the fact that she's hired all newbies and fired all her veteran teachers. sad! Any updates on the situation at Forest Hills HS? They are targeting older teachers. Chaz, there is talk of a $50,000 no strings buyout by May 31st. what do you know about this? I went to the buyout meeting and the Union gave a decent presentation. There were some takers of the buyout mostly people who have the years and felt ready to go. I don’t have the years and nor do I feel ready to retire just yet. The DOE and the Union are not really good at finding solutions to address the teachers in the ATR. This scene has been in existence for over a decade. How Respected Is Teaching Worldwide? Long Island Students Continue To "Opt Out"